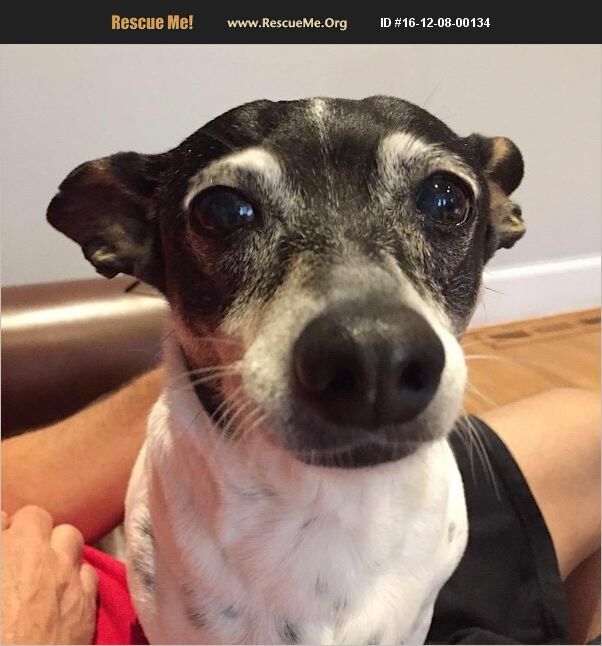 Louisiana Rat Terrier Rescue View other Rat Terriers for adoption. Penny was found wandering the streets of Louisiana over a year ago. When she was first brought into her foster home, she was afraid of everything and wouldn't let anyone touch her. No one will ever know the horrors she may have endured before being rescued, but the patience of her foster parents and Penny's own inner strength, along with an inexpensive antianxiety medication, have helped her work on overcoming her fears based in the past. She has come far! Today this 12-lb. Rattie (probably mixed with a dash of Chihuahua) will sleep next to her foster mom on the couch if her little bed is placed there, and she'll even offer her foster mom a lick on the nose. A pretty 9-year-old with gorgeous white eyelashes, Penny is fully house-trained and follows basic commands. She is a quiet communicator, who will stare at you with her warm, dark eyes to tell you that she wants something. Penny has learned that it's OK to take pleasure in life. She loves to run around the fenced backyard and to play hide-and-seek inside. She thinks it's great fun to chase and sniff out treats that have been tossed into various rooms in the house. She absolutely adores riding in the car! She also enjoys walks but still needs more training with the leash. When you come home, she delights in running up to you, so much so that her foster dad calls her 'the greeter doggy.' And she loves to snuggle in her own bed and will happily sleep there through the night. All that being said, there are still things that will restimulate Penny's fears and cause her to bite. For this reason, she should not be in a home with young children, who would not be sophisticated enough to recognize her signs of discomfort. For example, she only wants to be touched on her terms and will attempt to defend herself if someone towers over her or touches her from behind. She usually will give a snarl in warning, but if she is awakened by touching, she will startle and bite. Even now, the only time she will let her foster mom pick her up is at the vet's office. Her interactions with other dogs have been mixed. Her ideal family would consist of one or two adults with no children or other pets--someone calm and low-key, who is home most of the time. Penny can be a challenge, but she is living proof that patience and love can heal old wounds. When she approaches you to ask for a brief, gentle scratch and wags her tail ever so slightly, the feeling that you get is just about indescribable. If you're someone who has experienced that feeling before and who can nurture and appreciate small steps of progress based on growing trust, then yours is probably the home Penny has yearned for all along. See more photos of Penny in her online album at http://imageevent.com/newrattitude/penny. ========================================================================================If you are interested in adopting Penny, please go to New Rattitude's web site at http://www.NewRattitude.org/adopt.htm where there is detailed information and a link to our adoption application.